United went ahead though through Nicki Miles but Clark struck twice from dead balls before the break. Another Clark free-kick was turned in by Kim Stenning and despite Amy Watham firing a second Coventry goal in from long range, the Southerners held on to take the three points. Rebecca Barron, Helen Ogle and Kim Stenning all came back in for City but Coventry started well as they continued their pursuit of the FA Women’s National League southern premier title. Beth Merrick posed a threat early on which was dealt with by Lauren Cheshire and then midfielder Marie Gauntlett forced Lauren Dolbear into a great save, putting the ball out for a corner. The resulting corner saw the hosts take the lead. Miles was picked out from the set-piece and headed the ball at goal. Tiff Taylor put her foot in the way causing the ball to beat Dolbear to break the deadlock. United kept coming as Lois Jefferies controlled the ball from a free-kick turning into face to shoot but Dolbear managed to get her right hand to it and Taylor showed some heroic defending that denied Amy Watham at the post. Chi won a free-kick in dangerous territory and Clark whipped the ball in but Waine couldn’t get a touch as Susan Wood collected. Amber Hughes blasted over inside the Chi area, Ogle alongside her to put her off target. Just past the half-hour mark, Clark was fouled and the midfielder took her chance to draw her side level from 30 yards. Her initial attempt was blocked by Jefferies but the rebound was controlled by the midfielder who curled the ball into the bottom corner. Clark had another free-kick claimed by Wood and minutes later Chi had another free-kick as Gauntlett handled. Clark fired in the dead ball beating the wall and the Coventry goalkeeper to put Chi ahead just before half-time with her 15th goal of the season. Coventry looked to get back into the game after the break and had an early free-kick headed off the line by Jess Lewry. 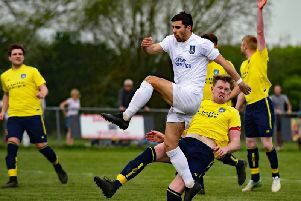 The home side had three chances to equalise, but Watham’s effort was claimed by Dolbear while Dermody and Miles hit efforts wide. On 64 minutes Chi made it 3-1 and it was created by another Clark free-kick. The ball was curled into the box to the back post, bouncing for Stenning who, under pressure from Chenise Austin, put the ball into the net. United found a second in the 71st minute from Watham, striking home from 30 yards to give the hosts hope with plenty of time remaining. Merrick struck the upright with less than ten minutes remaining and they kept up the pressure. In six minutes of injury time, Merrick had a free-kick 35 yards out to salvage a point for United. But it was fired over in what proved Coventry’s last chance. The Chi victory ended a 19-game streak for Coventry, their last defeat having been a 2-1 loss to Crystal Palace on May 5 last year. Chichester City host Watford at Oaklands Park on Sunday, April 14 (2pm) ahead of the Sussex County Women’s Challenge Cup final four days later. Chi City Ladies: Dolbear, Bazan (Ingram 86), Cheshire, Waine, Taylor, L Clark (Simmonds 55), Barron, M Clark, Lewry, Ogle, Stenning (Stephens 70). Unused sub: Tubby.